Avoiding Comma Splices - Click on "The sentence, please!" and a sentence containing a comma splice will appear in the top text-area. Repair the sentence. Avoiding Comma Splices II - Click on "The sentence, please!" and a sentence containing a comma splice will appear in the top text-area. Repair the sentence. Building and Revising Sentences with Appositives - The exercises on this page offer practice in building and revising sentences with appositives. Combining Sentences Using Appositives - Combine the sentences below into one sentence that uses as least one appositive. Comma, Colon, Semicolon, or Period? - Which of the following has correct punctuation? Colon Exercise - "Use a colon to improve the sentence's style by making it more forceful." Parts of the Sentence - Appositives - Combine the following sentences by using an appositive. Power Proofreading - Choose 6th grade then select; Interesting Jobs, School Forum, or any one of the mixed practice exercises. Practice Semi-Colons - Is the semicolon used correctly in the sentence below? Semicolons - Exercise 1 - Determine where the semicolon belongs. Then select the word that comes just before the semicolon. Semicolons - Exercise 2 -Determine if a semicolon is needed. If it is, select the word that comes just before the semicolon. 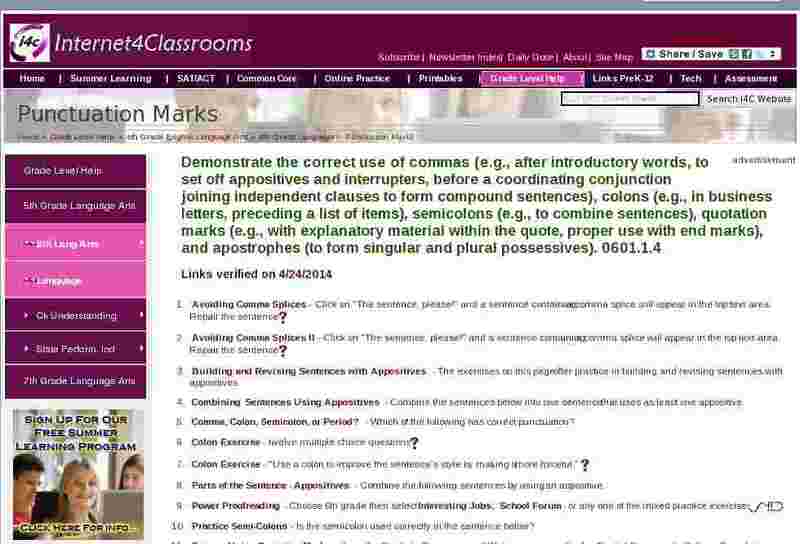 Semicolons and Colons Quiz - Choose the sentence with the correct punctuation. The Semicolon Quiz: Test Your Understanding. - Following is a short ten question quiz about how to use the semicolon. Answers and explanations are provided at the end of the quiz. Enjoy. Using the semi-colon - In this exercise you will have to decide which pairs of clauses can be connected with a semi-colon.